A quick way to attract followers is to contribute to popular group boards that already have a lot of followers. When you contribute quality pins to these boards, their followers become your followers, too—if they like your pins. An example is Ashley Rose of Sugar & Cloth who contributes to the board#LetsCelebrate Pin Party which has close to a quarter of a million followers. Exposing her pins to all of these followers should help convert some of them into her own. Then choose what you plan to follow—other pinners or boards. If you follow this procedure, you’ll be able to gradually build up a lot of followers. To make sure you only get followers who’ll be likely to interact with your pins—only follow people who have similar interests. There are two ways to gain followers when you run a Pinterest contest. You can either base entry in the contest upon following you or you can use a tool like Rafflecopter to give away a few extra entries for those who follow you. To gain followers, make following your account an obligatory part of your contest. An example is the Pin Win Spin! 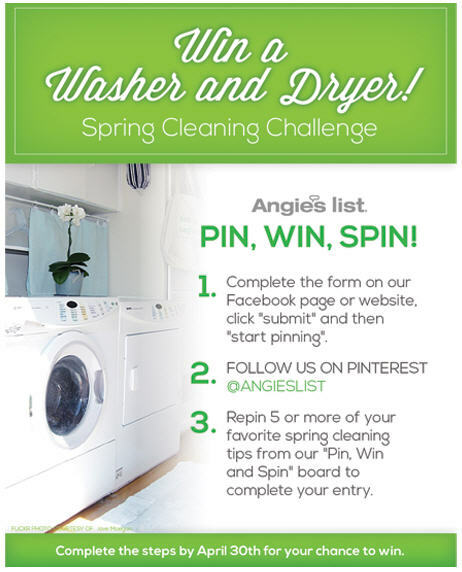 Pinterest contest by Angie’s List, where one of the requirements for taking part in the contest is to follow Angie’s List.